Hashtags on Twitter: How do you follow them? As I’ve mentioned before, hashtags are a powerful tool that allows Twitter users to track what many people (especially people whom you aren’t already following) are reporting or thinking about a particular topic or event. Here’s the catch: Hashtags aren’t an officially supported Twitter service. They’re merely a convention that Twitter users have adopted on their own, within the 140-character text-only constraints of tweeting. So you can’t really “follow” hashtags through the main Twitter site. Many third-party Twitter tools and services “play nice” with hashtags — but you must first know what these tools are and how to use them in order to get maximum value from hashtags. This is perhaps the most confusing point for people who are new to hashtags — but it’s important to understand. From your Twitter account you can only “follow” other Twitter users (accounts set up for an individual, organization, project, event, etc.). A hashtag is not a Twitter account that you can click a “follow” button for. A hashtag is not a source of tweets. Rather, it’s a way to label (tag) tweets so they can be easily pulled together. Keep that page open in a browser tab, and refresh it periodically to see the latest results. Or subscribe to the feed for your search in your feed reader, and check there occasionally for updates. There are many, many third-party tools for using and monitoring Twitter. Several of these allow you to set up columns to track tweets based on search terms. One that I use quite often is Tweetdeck, a very slick Adobe AIR application that runs on your computer. 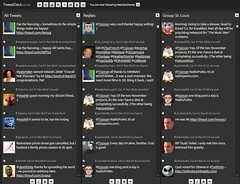 Tweetdeck allows you to configure up to 10 columns where you follow tweets according to criteria you specify. These can be all the people you follow on Twitter (your “friends”), or a subset of friends, or the ongoing results of a Twitter search. So if you search for #bisphenol via Tweetdeck, a column will appear showing all the latest tweets using that hashtag — and it will automatically update for you. You can add, delete, or reconfigure columns anytime you like. There are also configurable web-based Twitter tracking tools like Monitter that offer similar capabilities. Personally I prefer Tweetdeck, but that’s just a matter of preference. …So those are the bare basics for how to follow a hashtag. They’re definitely not the only options, but they’re some of the simplest. And if you want to look up what specific hashtags mean (or spread the word about a hashtag you launched or like), there are some hashtag glossaries that can help. 9 thoughts on Hashtags on Twitter: How do you follow them? Very well explained. Yet I’m surprised there’s nobody commenting here! I think you’ve done well for answering most of my questions regarding hashtags, about how should I follow up on them, if I ever need to. Obviously there are times when we hated to see # in the middle of the sentences, but if it’s used wisely for info-sharing rather than ‘spamming’ purposes, it would actually help alot. Thanks again, Amy for sharing this. Good article. I wish one could follow hash tags directly through your twitter account. In the beginning you could track tags but it seems that service was stopped. I’m using Monitter and the normal Twitter search to follow tags but clearly I need to give Tweetdeck a go. Thank you, thank you, thank you. Your article was the only one I found that explained how I can follow the hashtags that I am most interested in. Everyone else explained what they were, but you took it further for us newbies. I was under the impression you could join, then when someone posted to it, I would see their tweet. Again, thanks. Thanks greatly for telling everyone how to follow hashtags on Tweetdeck. I spent all last night trying to find it and nothing, but I tried a different term tonight and yours came up first. Whew! Your post was a great resource for me and helped clarify what the heck hashtags are. I was looking for a way to, effectively, do a distribution list for parents at my kids’ elementary school and thought maybe I could use Twitter hashtags for it. After reading your article, I realized they weren’t really set up for that. However, I poked around and found a way to do it by subscribing to the RSS feed for the hashtag search and then using a service to get the feed emailed to me. I’ve used it for several hashtags/topics and it works like a charm. I wrote instructions at nmc.itdevworks.com.